Shower loved ones with a sweet party atmosphere! Baby Girl Clothes Line' Baby Shower Room Decorating Kit features a clothesline motif with baby clothes and hearts printed on 3D table centerpieces for the gifts or snack table. 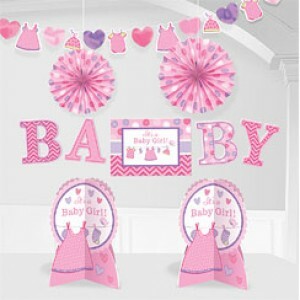 Find two-sided baby shower cutouts, a baby clothes string garland, and pink and purple dot hanging fans for the ceilings and walls. Please note some assembly required.